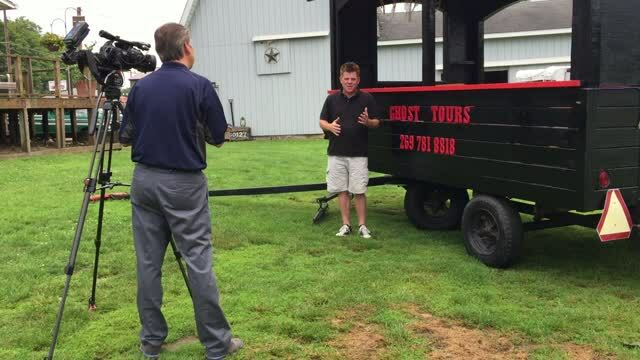 Recently Kevin Craig of Fox 17 out of Grand Rapids spent a day with the Carriage Co. staff interviewing locals and getting all the juicy details of our ghost tour! Watch and read our story here. Watch your local Fox 17 channel to check us out! Aaron Dimick of Channel 3 news came out to do a segment on the Carriage Co. This story was just released September 28th, 2015! Check out the article here. WJR radio station out of Detroit recently interviewed Marshall Carriage Co. to get a look into our company and the history that is Marshall. Listen in on your radio or online to hear our story! Marshall Carriage Co. was featured in episode 307 of Under The Radar! Marshall Carriage Co. got together with Michigan Ghost Watchers in 2013 to investigate the hauntings of Marshall further. Michigan Ghost Watchers investigated six Marshall locations which are known to be haunted. Brian Mason of Marshall Carriage Co. gave a presentation on starting and running a local business and on the legends and folklore of Marshall, Michigan.